A rising tide lifts all boats is an expression used by President John F. Kennedy, but which he did not claim as his own – he said he heard it used by a regional chamber of commerce. We all know what it means. The leaders of The Colorado Chamber Preferred Supporting Partner companies embody this belief by investing with extra passion in the work done by The Colorado Chamber to champion for a positive business climate in Colorado. They commit funding and engage their people in The Colorado Chamber programs such as the Chair’s Roundtable and EXECs Advocacy, knowing that their extra support will benefit their customers and employees, grow the economy, and create opportunity for all of Colorado. Thanks to Wells Fargo! Want your company displayed here? This is an opportunity for professional services firms of whom are deeply committed to The Colorado Chamber’s mission and to a thriving Colorado business community, to become a Preferred Supporting Partner. 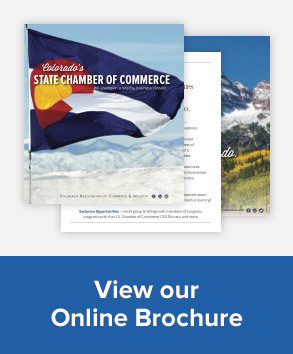 For information on how to become a Preferred Supporting Partner, please contact Dave Tabor of the The Colorado Chamber Business Partnerships team.